I would like to say a huge thank you to all of you who have supported Fabric Godmother over the past 5 years. I can hardly believe that the little dream I had of starting an online fabric shop has changed my life so much. From those late nights and long weekends I spent cutting and sending out orders while working a full time job to now. Fabric Godmother is my full time job and I have a small team working alongside me. The Fabric Godmother family includes my wonderful supportive partner (The Fabric Godfather), my lovely mum who comes along to all of our fairs and open days. Even my daughter was just 5 days old when she started coming into work with me! Not to mention all of the Bloggers and members of the Brighton Sewing Bee who have come to help out at our Open Days. Fabric Godmother could not exist without my customers and followers. 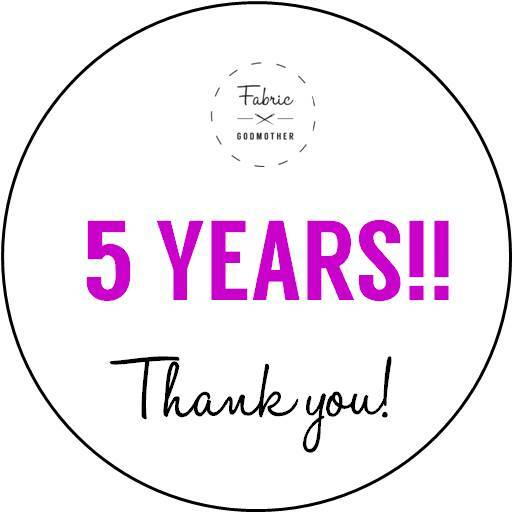 Every time you visit our website, comment on Instagram, like a picture on Facebook or send me an email telling me how much you have loved our fabric or enjoyed our customer service, it makes me very happy and proud of what we have achieved over the past 5 years. Now I would like to give something back to you all. This weekend you can get 10% off everything on the website. I will also throw in a free Fabric Bundle and a free Tape Measure. Simply use the code 5THBIRTHDAY at the checkout, from now until midnight on Sunday to claim your discount and 2 free gifts.